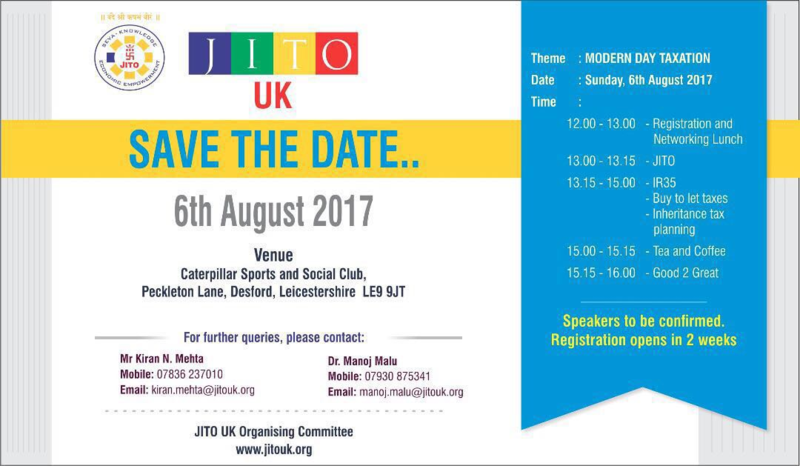 I have immense pleasure in inviting you and the members of the Jain Samaj Europe, Leicester for our next JITO-UK event on Sunday, 6 August 2017 on all important theme of Modern Day Taxation. We will have expert panel members to share their insight into IR35, Buy to let taxation and Inheritance tax planning, followed by a Good 2 Great session. This theme has been chosen based on the feedback from our members. Our previous events have been recognized for their outstanding quality of presentations and discussions, and acknowledged for the wealth of net-working opportunities they have provided. The event is free and registration can be done using the link http://www.jitouk.org/event-registration/ or visiting our website www.jitouk.org. Please do get in touch with me if you need any further information or support to encourage the members of the Jain Community in Leicester. The event is being held locally to you in Leicestershire and will serve as a great opportunity to meet fellow Jains from across the country. Although we have endeavoured to reach every member of Jain Community in the UK, we will be grateful if you can share this invitation with others who may have not been able to reach out to by direct forwarding or through social media. Looking forward to seeing many members of Jain Samaj Europe on 6th August 2017.